As I was wading through this book I needed something…lighter… to act as a counterweight for my poor brain which was being bombarded with horrid images that will probably give me nightmares for months. I could think of nothing better than another of (Colin) Bateman’s witty satires of the mystery genre, especially read to me by someone with the right accent for the story. THE DAY OF THE JACK RUSSELL follows on from 2009’s MYSTERY MAN and sees the nameless owner of Belfast mystery bookshop No Alibis (Murder is our Business) once again lukewarm on the trail of some dastardly criminals. Ignoring the case which his ex (?) girlfriend solves in 10 minutes thereby robbing our hero of the fee he was planning to charge a woman who thought she was being spied upon, this book focuses its attention on self-made businessman Billy Randall. He needs the services of a private eye because someone made a video of his giant billboard being defaced (a male appendage is painted on giant Billy’s head) and the video has become such a You Tube sensation that Randall fears his business is starting to suffer as no one can take him seriously. The case takes our hero on a strange and wonderfully madcap journey that involves taxidermy, the Chief Constable and MI5. The hero of this series is…unlikely to say the least. A cynical, self-absorbed, hypochondriac who would be lucky to leap over a small shrub let alone a tall building he is nevertheless strangely compelling even if not likeable in the traditional sense. And he is, for me anyway, terribly funny. I’m not normally a huge fan of the first-person point of view but it works well for comic novels and ‘no-name’s’ voice is one that particularly appeals to me (though I shan’t think too deeply on what shared traits might draw me to him). I’m not entirely sure the no-named hero shtick is sustainable (even here it was awkward) for more books but, having noticed there are two more in the series already, I’m willing to make allowances due to being so thoroughly entertained each time I pick up one of these novels. This is definitely a book I think you should sample before purchasing – you’ll know within a few pages whether or not it’s your kind of humour – and you need to be at least a minor fan of the crime genre to really appreciate some of the jokes and digs at recent publishing trends. If you’re lucky enough to share Bateman’s absurd sense of what’s funny then you’re in for a treat. 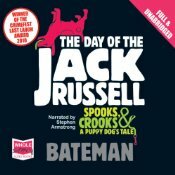 If you are an audiobook fan I’d highly recommend Stephen Armstrong’s narration – he is now the voice of mystery man for me and I am chuffed to see he’s read more of Bateman’s novels for my personal listening pleasure. This entry was posted in Bateman, book review, Ireland. Bookmark the permalink. Bernadette – Oh, this sounds like a terrific antidote to…that other book. You were wise to do that ‘balancing act.’ I’m glad you reminded me of how funny Bateman can be too. Not as you say everyone’s choice, but still… I’ve not read this one (yet), but I ought to; I do like the way he writes. I have wanted to try this author. Your reviews (I checked out the one for Mystery Man also) have gotten me interested. He sure has written a lot of books. I will definitely have to sample one of his books because a lot of times I just don’t get humor in mystery novels. Hopefully you have a good library near you Tracy and you can try something of his for free….humour is such a subjective thing that I think you don’t want to have the added pressure of having spent money on a book and are just itching for it to make you laugh.